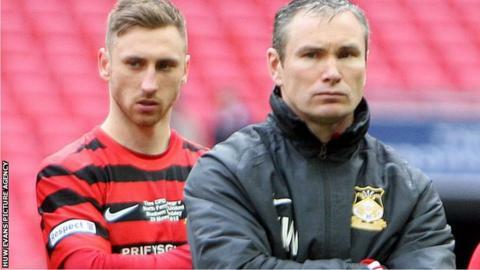 Kevin Wilkin claims his treatment was "abysmal" after being dismissed as manager of Wrexham in March. Wilkin was sacked the day after Wrexham were beaten on penalties in the FA Trophy final by North Ferriby United. Now manager of Brackley Town, Wilkin told Radio Wales his pay was stopped over a "grey area" in his contract. However, the club say they are disappointed with the claim and contend Wilkin was advised by the League Managers' Association over his deal. "The fact that Wrexham chose to stop paying me when it's well documented they have gone out and got a new manager I felt was poor," said Wilkin. "Dismissing me is one thing but the way I've been treated is pretty abysmal really. "I made them a lot of money last year, probably £750,000. "I've stayed silent on the situation, I've kept my dignity over the situation and to stop paying me all of a sudden over a bit of a grey area in my contract for me was poor." Wilkin succeeded Andy Morrell as Wrexham boss in April 2014 and in his 38 league games in 2013-14 season, Wrexham won 13, drew 12 and lost 13. His successor Gary Mills was appointed on April 28 following a period when Carl Darlington looked after the first team. In their statement, the club said: "There were no 'grey areas' in the contract between the club and Kevin Wilkin. "Kevin received advice from the League Managers Association (LMA) both before signing his contract at Wrexham AFC and after leaving the club. The LMA are experts in drafting contracts to protect their members. "Kevin referenced additional income generated for the football club in season 2014/15. The figures mentioned are wholly inaccurate. "Later this year we will hold the AGM of the football club which will show our income and expenditure for season 2014/15 and how that compares to the previous financial year. Wrexham AFC is a fully transparent company owned by the fans. "We publish our full accounts at our AGM annually which we have done from day one of supporter ownership and our accounts for the previous financial year are currently undergoing the statutory audit." Wilkin's Brackley side will face Newport County at home in the first round of the FA Cup on Saturday, 7 November.